Last weekend the Alfa Klub Croatia welcomed Alfisti from across the country and also from abroad as it held its showpiece annual summer meeting on the nation's only proper race track at Grobnik. This was the ninth meeting of the organisation of the Alfa Klub Croatia and its third major international event. The meeting started at eleven o'clock in the morning. 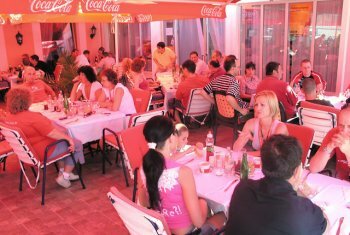 The place to get together was Bakarac, situated on the cost at the bay of the same name. 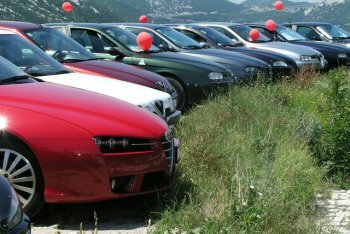 Columns of Alfa Romeos from all over the country arrived, streaming in until lunchtime, which was held at one o'clock. The first far-travelling guests to arrive were from the Italian 147 Virtualclub, who had undertaken a long journey in order to take part, and with great scenic views, over one hundred Alfisti arrived and enjoyed good company. Thanks must go to our sponsors who organised the popular lottery. After lunch we began the journey to the Grobnik race track with a column of 70 cars after snaking their way to the circuit where another 20 Alfa Romeos were waiting to join up. Bearing in mind that Alfa Romeo has just a 0.7 percent share of the Croatian new car market today, this was an excellent turn out in a country where many of the owners' feel a very strong passion for the marque. The Grobnik race track is the country's only proper circuit, and it was home of the Croatian MotoGP World Championship round from 1978 up to 1990, until the regional war between 1991 and 1995 caused the circuit to fall out of international use. The last major international race was organised on 17.06.1990. Today the track has FIA homologation for almost all kinds of racing, except for Formula 1. Last year it hosted rounds of the international Alfa 147 GTA Cup. This was the ninth Alfa Romeo meeting to be organised by the Alfa Klub Croatia, and its third major international event. Last weekend the Alfa Klub Croatia welcomed Alfisti from across the country and also from abroad as it held its showpiece annual summer meeting on the nation's only proper race track at Grobnik. The Grobnik circuit is 4.168,75 m long with 2.017,63 m of those being curved; its minimum width is 10 m while the widest point - at the start/finish line - is 15 m; it has max 10 % ascent and 15 curves. The track record is a lap of 1:28.69 set by Wayne Rainey in the 500cc class in 1990 at an average speed of 168,178 km/h. Directly before the Alfa Romeos took to the track (at 5 o'clock) the Alfisti were able enjoy watching a motorcycle race under the title of "Open European Road Racing Championship 2007". While this was going on some of the Alfisti warmed up their tyres and preparing their Alfa Romeos for the session. The Grobnik track is well-known as having a rough surface so some of the owners had taken reserve sets of tyres. The first lap was reserved for all Alfisti, for a slow and nice ride because at that one moment on the circuit were all 80 Alfa Romeo cars which were taking part in the day.. First 15 minutes was for slow ride. After the gentle 'parade' laps it was time for the 'braver' drivers to speed up the pace and finally for the meeting to wrap up at soon after 7 o'clock. Everyone headed home delighted by the successful day and it is with impatience that many of us await the next meeting of Alfisti here, which will be jubilee 10th meeting of Alfa Klub Croatia.